How should social systems be designed in order to solve intergenerational policy issues affecting the sustainability of our society, such as global environmental problems, a declining population, and swelling government debt? How can we ensure that we pass on a sustainable natural environment and human societies to our future generations? A research movement called ‘future design’ is aiming to find the answers to these questions. The movement is led by Tatsuyoshi Saijo, founding director of the Kochi University of Technology Research Institute for Future Design, and was initiated in 2012 by a group of researchers, mainly from Osaka University. It has expanded across disciplinary boundaries to involve researchers from various fields including economics, psychology, ethics, and neuroscience. On 27-28 January 2018, the first Future Design Workshop was held at the Research Institute for Humanity and Nature. One of the purposes of future design research is to bring together actors representing the interests of future generations to take part in present-day political decision making. An experiment introduced by Hara et al. (2017) reflects this idea. The experiment, conducted in 2015 in the town of Yahaba, Iwate prefecture, asked citizens to draw up a long-term vision for the future course of the town until 2060, with the help of a group of researchers studying future design. The participants were split into four groups, each consisting of five to six members, which discussed and developed a draft plan. Two of the groups represented the interests of the current generation, whereas the remaining two groups were asked to stand in the shoes of future generations who would be active in 2060. As it turned out, there was a distinct difference between the first two and latter two groups in their way of thinking and agreement reached. For instance, whereas the current-generation groups drew up a vision as an extension of the status quo, taking the constraints and challenges that exist today as given, the future-generation groups called for efforts to address tough challenges in order to enhance the strengths of the town. When they were interviewed half a year later, those in the future generation groups said that they had been able to take an objective view of themselves and reconcile conflicting interests between their two selves - the present self and the future self – and that they were glad to have been able to think that way. Saijo (2015) calls this future self an “imaginary future person” (Figure 1). If those of us who belong to the current generation think as an imaginary future person, we would be able to make our society more sustainable. Some researchers are considering the possibility of establishing a government agency representing the interests of future generations – for instance, a Ministry of the Future as part of the central government and a Department of the Future as a unit within local governments – as a specific measure to reform relevant institutional systems. Source: Created by the author based on materials provided by Tatsuyoshi Saijo. At the workshop, a series of social experiments with deliberation among citizens conducted in various part of Japan were presented, including the one conducted in Yahaba, Iwate prefecture, as well as others run in Matsumoto, Nagano prefecture, Kochi prefecture, and Onuma in Hokkaidwere. In all of the experiments, the presence of a participant assigned to represent the interests of future generations made a difference to the outcome of deliberation. Interestingly, researchers had the impression that there were significant changes in the psychology and emotions of those participants assigned to represent future generations. This suggests that some changes may have occurred in the brain activity of those participants. In light of this observation, some researchers proposed a research project in which functional magnetic resonance imaging would be used to measure changes in the brain activity of participants in the course of deliberation. In addition, a group led by University of Tokyo Professor Tatsuya Kameda presented the results of a psychological experiment, pointing to the finding that those with offspring are more concerned about the interests of future generations than those without. Meanwhile, Waseda University Professor Tomohide Suzuki introduced India’s ‘one additional line’ financial reporting scheme as a real-world example of successful institutional design. The scheme made it mandatory for listed companies to report the amount spent on corporate social responsibility activities in the income statement. Concerned about their reputation, Indian listed companies have increased their corporate social responsibility spending significantly, to the tune of 300 billion yen a year. Kochi University of Technology Professor Yoichi Hizen presented the results of an experiment that tested how people react to the introduction of Demeny voting, which would give minors the right to vote and let their parents or guardians vote on their behalf. The experiment found that those without children voted more in favour of the current generation under a Demeny voting system than under the conventional voting system. This suggests the possibility that the emergence of those representing the interests of future generations could provoke a backlash from other people. This is an interesting finding and should be kept in mind when considering a new system design. There are three important questions which should be considered as possible directions for future design research. The first is how an imaginary future generation (represented by public agencies such as a Ministry of the Future) would function. Suppose that we create agencies representing the interests of future generations. But, then, how and why can we be sure that these agencies will truly represent the interests of future generations and keep an eye on the public policy process of the current generation? If the experimental finding that participants assigned to represent the interests of future generations were able to act as imaginary persons holds true in general terms, public agencies such as a Ministry of the Future could work properly. Assigned to represent future generations, officials of the Ministry of the Future would take on the personality of imaginary future persons. 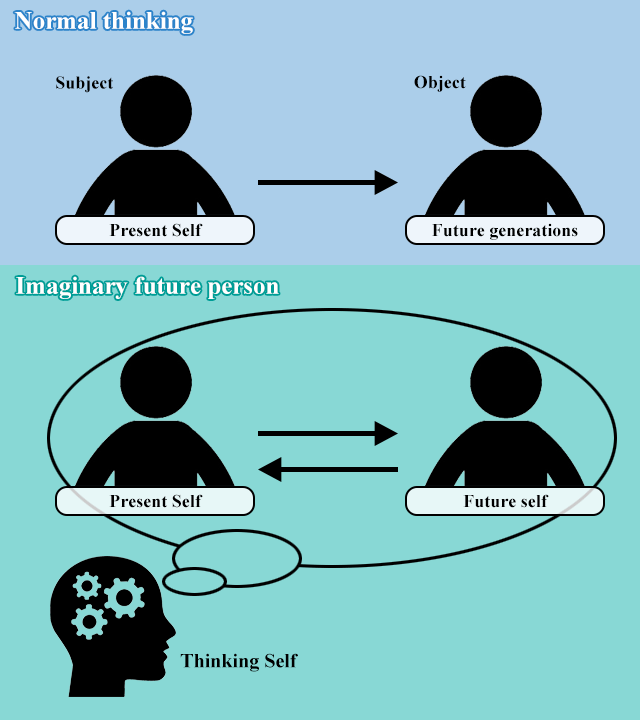 In order to evaluate this point scientifically, it is necessary to explain the mechanism through which imaginary future persons form their identity by applying statistical techniques typically used in brain science and psychology. The second question is where to find the politico-philosophical grounds for justifying the creation of an imaginary future generation (i.e. the establishment of a new institutional system such as a Ministry of the Future). In order to establish a new institutional system for future generations, such reform must have legitimacy in the current political system of democracy. For instance, many scholars in law and political science remain opposed to Demeny voting, which they see as violating the fundamental principle of democracy of ‘one person, one vote’. Simply being necessary for future generations does not necessarily warrant public acceptance. In order to gain broad public support, we need to develop a political philosophy that justifies the creation of an imaginary future generation in the current landscape of democracy. We might be able to justify it by drawing on social contract theory advocated by Rawls (1971), an American philosopher, using the ‘veil of ignorance’. If people are to agree to a social contract without knowing which generation they will be born into (i.e. they are covered by ‘the veil of ignorance’), they would be afraid of being born into the most unfortunate generation and therefore should support the creation of an imaginary future generation so as to reduce the burden on this generation. The third question is what it would take for ordinary people to spontaneously become imaginary future persons. In other words, what does it take to make people more altruistic (loving) towards future generations? This may be better defined as a political thought question, going beyond the realm of science. Although it may seem paradoxical, when we think about love for future generations, connecting with the past is a critical factor. Disconnecting our current society from its past would make us feel rootless, which would undermine our motivation to fulfil our responsibility as the current generation and pass our society onto future generations. The sense of weariness resulting from the severance from the past would gradually paralyse society. This is what we might call the ‘revenge of the past’, which makes us delay efforts to tackle fiscal and environment problems. Only when people feel that their present is connected with the past can they embrace love for future generations and feel willing to take on whatever it takes to pass this world on to the next generation. Just like love for individuals, love for the world is a faith given by history, not by reason. Maybe we should say that our challenge is to restore our history from the past into the future and rediscover the public goods that should be passed down throughout history. Future design research may change the nature of human knowledge in a broad spectrum of fields including not only social science but also neuroscience and political philosophy. It is hoped that various studies will be carried out under this new framework. Author’s note: This column was reproduced with permission from the Research Institute of Economy, Trade and Industry (RIETI). Saijo, T (2015), “Future design: Concept for a Ministry of the Future”, Social Design Engineering Series, Kochi University of Technology. Kamijo, Y, A Komiya, N Mifune and T Saijo (2017), “Negotiating with the future: Incorporating imaginary future generations into negotiations”, Sustainability Science 12(3): 409-420. Hara, K, R Yoshioka, M Kuroda, S Kurimoto and T Saijo (2017), “Reconciling intergenerational conflicts with imaginary future generations - evidence from a participatory deliberation practice in a municipality in Japan”, Social Design Engineering Series, Kochi University of Technology. Rawls, J (1971), A theory of justice, Cambridge: Harvard University Press. Shahrier, S, K Kotani and T Saijo (2017), “Intergenerational sustainability dilemma and the degree of capitalism in societies: A field experiment”, Sustainability Science 12 (6): 957-967.